Yong Nuo YongNuo Speedlite YN-565EX Shoe Mount Flash for Nikon. Condition is Used. Shipped with USPS Priority Mail. The support of wireless TTL for Canon eTTL and Nikon i-TTL and a nearly complete feature set together with high quality makes it an excellent flash. Wireless TTL Slave: Use the comfort of TTL wirelessly with Canon eTTL and Nikon i-TTL! This flash will appear to be new when it arrives with only VERY minor exceptions. This was only ever used with Nikon bodies. Supports for Nikon's System and Supports Auto/Manual Zooming. 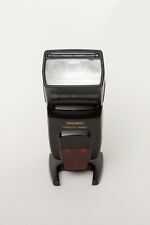 Yong Nuo YongNuo Speedlite YN-565EX Shoe Mount Flash for Nikon. Condition is Used. Hardly ever used excellent condition I'm just not a photography person. Super excellent condition. The YN565EX can be triggered by hot-shoe, flash command slave mode, optical S1, and S2 (pre-flash-canceled mode). For Nikon D3000,D3100,D5100，D5000,D3200, D6, etc. For Nikon D300, D300S,D7000. The TTL flash with large guide number. YONGNUO YN-565EX III Flash Speedlite in ETTL Wireless Slave / Manual /. The YN565EX III is equipped with the USB interface, you can download the latest firmware from YONGNUO official website to upgrade the speedlite. Wireless feature Yongnuo YN-565 III for Canon Yongnuo YN-565 III for Nikon. Yongnuo YN-565EX III for Nikon version arrives, it has the main functions ofWireless Slave TTL mode, Digital TTL mode, Manual Mode and“Multi” Mode. The YN565EX III is equipped with the USB interface, you can download the latest firmware from YONGNUO official website to upgrade the speedlite. The YN565EX III is equipped with the battery electric power display function, allows you to check the battery remaining capacity easily. Supports Firmware Upgrade: equipped with the USB interface, you can download the latest firmware from YONGNUO official website to upgrade the speedlite. 1 Speedlite. Flash mode: TTL, M, Multi. Wireless triggering distance: 20~25m indoors, 10~15m outdoors. YONGNUO YN565EX III for N. The YN565EX III is equipped with the USB interface, you can download the latest firmware from YONGNUO official website to upgrade the speedlite. The YN565EX III is equipped with the battery electric power display function, allows you to check the battery remaining capacity easily. Modes: TTL, Manual, Multi. Wireless (infrared) eTTL slave for Canon and i-TTL slave for Nikon. FE lock (Canon) and FV lock (Nikon) supported for locking the flash exposure before recomposing the image and taking the final picture. Features: Supports Firmware Upgrade The YN565EX III is equipped with the USB interface, you can download the latest firmware from YONGNUO official website to upgrade the speedlite. High Speed Recycling System The recycling time for full output just takes 2 seconds; you can get high speed current-return experience even without using brand new batteries, which will only takes 3-4 seconds. Support the Battery Remaining Power Real-time Display The YN565EX III is equipped with the battery electric power display function, allows you to check the battery remaining capacity easily. Compatible With C and N’s Optical Transportation Wireless Slave Flash. The YN565EX III is equipped with the USB interface, you can download the latest firmware from YONGNUO official website to upgrade the speedlite. YONGNUO YN565EX III. When the sound prompt system is enabled，different sound modes will prompt different working conditions of the speedlite so as to allow you to focus on shooting process. Specification: YN-565EX III for Canon camera is released now, the difference between the second version and the third version is equipped with the USB interface. Feature: 1) Supports Firmware Upgrade The YN565EX III is equipped with the USB interface, you can download the latest firmware from YONGNUO official website to upgrade the speedlite. 2) High Speed Recycling System The recycling time for full output just takes 2 seconds; you can get high speed current-return experience even without using brand new batteries, which will only takes 3-4 seconds. 3) Support the Battery Remaining Power Real-time Display. 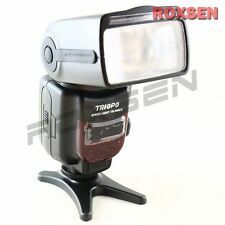 Can be triggered by 580EX II, 7D/60D/600D and flashes as TTL mode as well as M/Multi mode. YN565EX II YN-565 E-TTL Flash Speedlite w/ i-TTL Remote. TTL FLASH WITH LARGE GUIDE NUMBER. COMPREHENSIVELY SUPPORTS TTL FUNCTIONS. Features: Supports Firmware Upgrade The YN565EX III is equipped with the USB interface, you can download the latest firmware from YONGNUO official website to upgrade the speedlite. High Speed Recycling System The recycling time for full output just takes 2 seconds; you can get high speed current-return experience even without using brand new batteries, which will only takes 3-4 seconds. Support the Battery Remaining Power Real-time Display The YN565EX III is equipped with the battery electric power display function, allows you to check the battery remaining capacity easily. .
YONGNUO YN565EX III for N ØSupports Firmware Upgrade The YN565EX III is equipped with the USB interface, you can download the latest firmware from YONGNUO official website to upgrade the speedlite. ØHigh Speed Recycling System The recycling time for full output just takes 2 seconds; you can get high speed current-return experience even without using brand new batteries, which will only takes 3-4 seconds. ØSupport the Battery Remaining Power Real-time Display The YN565EX III is equipped with the battery electric power display function, allows you to check the battery remaining capacity easily. ØCompatible With C and N’s Optical Transportation Wireless Slave Flash. 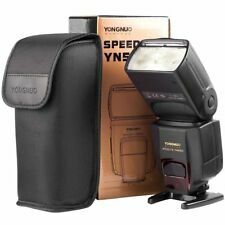 YONGNUO TTL Flash Speedlite YN-565EX III YN-565EXIII for Canon 6D 7D 70D 60D 600D 5DII 650D. YONGNUO YN565EX III TTL Flash Speedlite. Supports Firmware Upgrade:equipped with the USB interface, you can download the latest firmware from YONGNUO official website to upgrade the speedlite. Suitable for: ★ Camera and Flashes in Wireless TTL Slave mode: Camera: Canon 7D, 60D, 600D Flash: Canon 580EX II, Nikon Nikon SB-900, SB-800, SB-700 ★ Camera in TTL function: Canon 5D II III 30D 40D 50D 350D 400D 450D 500D 550D 600D 1000D 1100D ★ Camera in S1 / S2 mode: Any DSLR camera with standard hot shoe Package included: YN565EX flash × 1 Mini stand x 1 Manual x 1 (Original Manufactory package). Nikon D7200 D7100 D7000 D5500 D5100 D5000 D3100 D3000 D800 D700 D300 D300s D200 D90 D80 D60 D40x D40. ★ Supporting Canon and Nikon Wireless TTL Slave Mode. ★ TTL Flash with very powerful guide number. Wireless TTL Slave: Use the comfort of TTL wirelessly with Canon eTTL and Nikon i-TTL! Flash Mode Manual, S1, S2: Many photographers like the manual mode in strobist photography, because it gives them most freedom in composing their pictures. The YN565EX can be triggered by hot-shoe, flash command slave mode, optical S1, and S2 (pre-flash-canceled mode). The TTL flash with large guide number. Comprehensively support TTL functions. Flash mode: TTL, M, MULTI. Supports Firmware Upgrade: equipped with the USB interface, you can download the latest firmware from YONGNUO official website to upgrade the speedlite. 1 Speedlite. Flash mode: TTL, M, Multi. External interface: hot shoe, PC port, USB port, external charging port. It features a guide number of 190' at ISO 100 in the 105mm position on the focusing head while providing wide coverage within a zoom range of 24 to 105mm. The YN565EX III is equipped with a USB interface for downloading the latest firmware from the Yongnuo website. Canon 5D, 7D, 6D, 7DII. 30D, 50D 450D 500D 550D 600D 650D 700D 750D 800D 1300D 1200D 1100D 1000D. The YN565EX III is equipped with the USB interface, you can download the latest firmware from YONGNUO official website to upgrade the speedlite. Flash Speedlite & Accessaries. 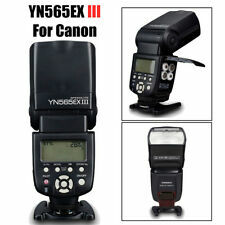 YONGNUO Flash Speedlite YN-565EXII Canon Version. LCD screen: Displays all functions and application setting of the speedlite, convenient for users’ examination and quick setting. YONGNUO YN565EX Hot shoe Flash SPEEDLITE. The YN565EX can be triggered by 580EX II, SB-900/800/700, 7D/60D/600D, Nikon c-command and ST-E2, and flashes as TTL mode as well as M/Multi mode. The YN565EX can be triggered by hot-shoe, flash command slave mode, optical S1, and S2(pre-flash-canceled mode). YN-565EX II is the upgrade version of YN-565EX. It supports wireless TTL in Canons E-TTL and Nikons i-TTL versions. 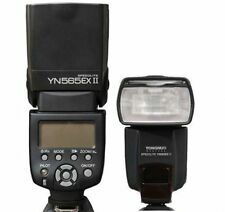 YONGNUO Flash Speedlite YN-565EX II for Canon Version. C order of N’s internal flashing and wireless signal of ST-E2,supports 4 channels,achieves external TTL and. The YN565EX III is equipped with the USB interface, you can download the latest firmware from YONGNUO official website to upgrade the speedlite. YONGNUO YN565EX III for N. The YN565EX III is equipped with the battery electric power display function, allows you to check the battery remaining capacity easily. The YN565EX III is equipped with the USB interface, you can download the latest firmware from YONGNUO official website to upgrade the speedlite. YONGNUO YN565EX III. The YN565EX III is equipped with the battery electric power display function, allows you to check the battery remaining capacity easily. The YN565EX can be triggered by hot-shoe, flash command slave mode, optical S1, and S2(pre-flash-canceled mode). YN565EX provides PC port，you can make the flash synchronously by connecting to the PC port. Wireless feature Yongnuo YN-565 for Canon Yongnuo YN-565 for Nikon. Yongnuo YN-565EX for Nikon version arrives, it has the main functions ofWireless Slave TTL mode, Digital TTL mode, Manual Mode and“Multi” Mode. Nikon D7200 D7100 D7000 D5300 D5200 D5100 D5000 D3300 D3200 D3100 D3000 D700 D300 D300s D200 D90 D80 D60 D40x D40 D3 D3x D3s D2x. Flash Speedlite & Accessaries. 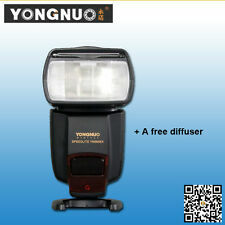 YONGNUO Flash Speedlite YN-565EX Canon Version.